Because BirdScope has received many inquiries about House Sparrows, we have decided to present a special forum in this issue. Lab staff, citizen-science participants, and British and American scientists share their views about this tenacious species, including what we should do about them and why we should pay attention. 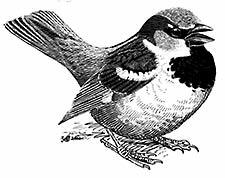 The trouble with House Sparrows in North America began in the 1850s when they were sought as the solution to eradicating insect pests such as cankerworms and dropworms, and to alleviate the homesickness of European immigrants who longed for familiar birds. They were first successfully released in Brooklyn, New York, in 1853, then were independently introduced to some 100 other cities in subsequent years. By 1886, they had spread across one million square miles of the United States. By 1905, they had settled nearly the entire country and had become firmly established as urban nuisances and agricultural pests themselves. Through a different lens, University of Kentucky biologist David Westneat offers a fascinating glimpse of House Sparrows as subjects of scientific study. Melinda LaBranche, project leader of the Lab’s Urban Bird Studies, explains how urban residents can observe intriguing behaviors among House Sparrows in cities, and how House Sparrows can play an important role in connecting children with nature. Although House Sparrows are among the most familiar birds and among the best-studied in the laboratory, birders and population biologists alike have paid them little heed until recently. In Britain, where House Sparrows are native, the species is declining. Ornithologists Humphrey Crick and Mike Toms of the British Trust for Ornithology (BTO) lament the years of data lost because monitoring programs ignored House Sparrows in the past (see page 14). The BTO has now raised more than £66,000 ($115,000) in donations to investigate why House Sparrows are declining in Britain. Meanwhile, scientists in the United States know little about what regulates House Sparrow numbers in urban and rural areas or about the impact of House Sparrows on native songbird populations. Data from Project FeederWatch show declines in the numbers of House Sparrows at feeders since 1989. Urban Bird Studies is collecting data on House Sparrows and other urban birds, and The Birdhouse Network is taking a look at House Sparrows as nest-box competitors. Birders who encounter House Sparrows can submit their counts to eBird, an online checklist program maintained by the Lab and Audubon. These data will become part of a long-term permanent record that scientists and educators can use in future years to understand population trends of invasive species and their impact on native birds. We may not like House Sparrows, or want them, but here they are. As we deal with them, we can take a close look and learn what they have to tell us.